Each day brings brilliant new discoveries in precision medicine: mate-pair sequencing of cancer tumors; identifying a gene defect in ALS; saving a woman’s life who might have succumbed to breast cancer without her mouse avatar. Each day precision medicine—also known as individualized medicine—saves a life, improves a life, gives a patient hope for the future. But how does that promise get translated to practice? How does it move from the laboratory bench at a research institutions like Mayo Clinic to the bedside of the family doctor in Spokane, Wash., or Nagaoka, Japan? How does the transformative power of precision medicine reach beyond the collaborative teams of physicians and researchers at Mayo to the small-town doctor in rural Michigan, to the genetic counselor in San Francisco, to the creative young investigator in Texas? But more importantly, how does it reach the mother with an ill daughter? The person who suffers severe side effects to the common drug treatment? To the young man who’s suddenly faced with cancer? How does it reach the patient? It’s a challenge given all the more importance by President Barack Obama's announcement in his State of the Union address that his administration would seek to fund a major new Precision Medicine Initiative. The enthusiasm for this initiative derives from the assumption that precision medicine will contribute to clinical practice and advance the health of the public. At the Mayo Clinic Center for Individualized Medicine we believe in the promise of precision medicine and are committed to bringing it to the practices of everyone in the health care community. One way for us to translate the promise of genomic medicine is to offer expert speakers, informative breakout session, multiple case studies and a poster session to provide opportunities for every day health care practitioners to discover and discuss emerging topics in applied genomics. Not theoretical. Not the kind you read about in science fiction. But applied. We call that from Promise to Practice. Your practice. Join the conversation about genomic medicine and register now for Individualizing Medicine 2015: From Promise to Practice, which runs from September 20–23 in Rochester, Minn. 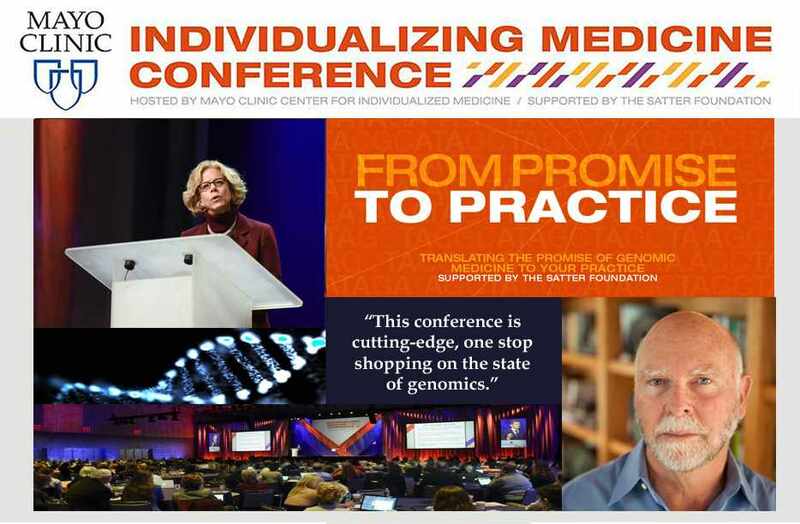 Hosted by the Mayo Clinic Center for Individualized Medicine, the conference features plenary speakers like J. Craig Venter, Ph.D., and Gianrico Farrugia, M.D., Stephen Friend, M.D., Ph.D., and Edison Liu, M.D. Pharmacogenomics Implementation at the Bedside: What Works, What Doesn’t? For a complete list of speakers, visit the conference website. The Individualizing Medicine Conference 2015 also provides the perfect opportunity to network with colleagues from around the world with an interest in genomics and how it can and will change patients’ lives. Industry experts and exhibitors are there to answer questions on the newest technologies, products and potential collaborations. Check our website for a list of our current supporters and exhibitors . It’s the best way to take the promise of genomic medicine into the daily practice of improving the health of your patients. And, more than anything, we believe it’s still about the patient. From promise to practice. Visit Individualizing Medicine Conference 2015 for more information. This activity has been approved for AMA PRA Category 1 Credit™. Additionally, ANCC contact hours are offered for nurses and CEUs are pending for genetic counselors and CPEs for pharmacists.